The first time I saw mention of a whole chicken in the slow cooker was in the Trader Joe’s Fearless Flyer. It said, in essence, put the chicken in the slow cooker and turn it on for eight hours. That worked well for the Trader Joe’s whole chicken that didn’t have the giblets, etc. 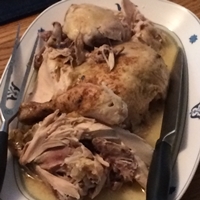 I was looking for something simple for a recent Friday dinner and thought that a whole slow cooker chicken would work. The grocery store’s chickens were about six pounds, a lot for two people, but I bought one anyway. I hated to toss the neck, giblets, and so on, but I am not skilled in dealing with such parts. I got serious about the seasoning, and created a rub with cumin, coriander, oregano, granulated onion, granulated garlic, cayenne, and smoked paprika. I turned the crock pot on high for three and a half hours and low for another four. The chicken was fall-off-the-bone tender and had a distinct Middle Eastern taste. And the advantage over a rotisserie chicken was neither Terry nor I had to run out to the grocery store at dinner time. Not only that, there was enough meat left over to seal up and freeze for two more meals.